Microsoft is testing technology that will track what items people pick up while shopping, and another Redmond company is working with Microsoft on the technology for physical stores, news services reported. Microsoft may be gearing up to challenge Amazon on its home turf — the world of retail shopping — by developing cashier-less technology for grocery stores. Six people told Reuters news service that the Redmond software company is testing technology that will track what items people pick up while shopping, something that could eliminate or reduce the need for cashiers. Redmond-based AVA Retail, which develops technology to collect data about shoppers in stores, also told The Associated Press it is working with Microsoft on the technology for physical stores. 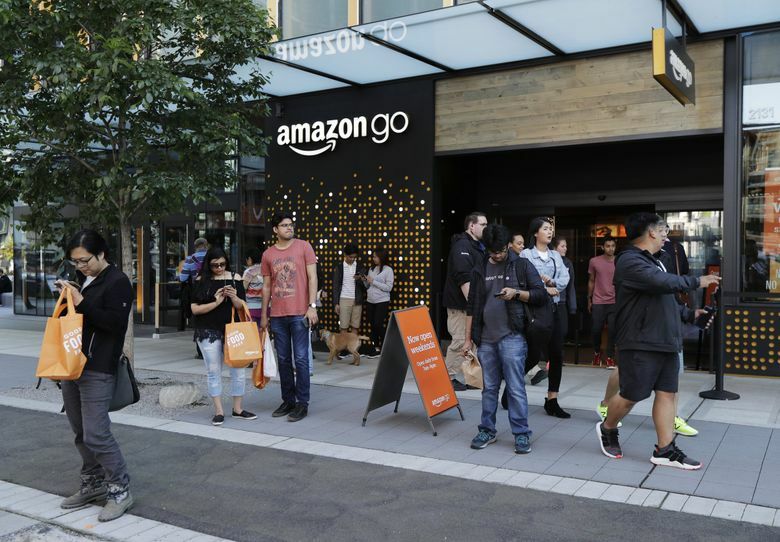 Amazon’s convenience store that uses cashier-less technology, Amazon Go, opened to the public in Seattle in January. That store requires shoppers to swipe an app when they walk in, then uses computer-vision technology to track them and their purchases around the store. When people are done shopping, they can walk out and are charged through the Amazon app. Amazon could sell that technology to other retailers. But a competing technology from Microsoft could be an attractive option because retailers might see Microsoft as less of a competitive threat than Amazon. Microsoft’s interest in the technology is hardly a secret. Microsoft for years has operated a Retail Experience Center from a nondescript building near its Redmond headquarters campus, meant as a showcase for Microsoft products as well as an experimental environment for the company’s business-sales groups to try out emerging technologies and show them to potential customers. During a media tour in 2015, Microsoft showed how a big-box electronics store could keep track of where customers were and what items they were looking at or picking up by using technology borrowed from Microsoft’s Kinect motion sensor. A tour of the same Microsoft retail facility in 2016 showed Bluetooth beacons that could track customers’ movement, Redmond Magazine reported. At the time, the company was partnering with AVA Retail to pinpoint what a shopper was reaching for on a shelf. AVA Retail CEO Atul Hirpara said Thursday that the company is using Microsoft’s Azure cloud to develop technology that will enable stores to have a clerk-less checkout experience. AVA’s technology could roll out in the next six to eight months, he said. The company plans to co-sell the product with Microsoft, but the clerkless techology is owned by AVA, Hirpara said. Reuters reported that Microsoft’s technology could be getting closer to deploying in stores. Microsoft could be in talks with Amazon rival Walmart, Reuters’ sources said. AVA’s Hirpara declined to disclose if his company has any ongoing talks with Walmart.